Early beta of the KotOR-era sides. Conquest mode on the stock Mygeeto map, one mode for infantry and one for heroes. 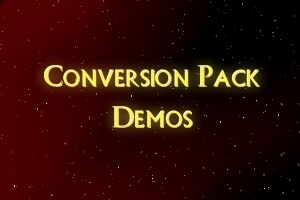 Note that not all heroes nor all infantry are included in this demo. Hey how do i install this? It comes with a readme; the readme has installation instructions. "Installing: To install, extract everything to your desktop. Copy (or cut) the folder "GameData" (which may be inside folder "korsides") and place it into your "Star Wars Battlefront II" folder. By default this will probably be C:Program FilesLucasArtsStar Wars Battlefront II. Allow it to overwrite - it's not actually overwriting files, it's just adding a new set of first-person animations. If you are concerned about overwriting files, though, feel free to back up anything you like." Didn't work for me, it crashes at the start. I pasted the 'data' folder from 'KOR' over the 'data' folder in 'gamedata' and everything seemed to be running fine but after I run the .exe it crashes back. I noticed an 'addme.script' in the KOR folder, am I supposed to do something with that? Currently downloading the full version anyway so don't lose sleep over this.